If any agents/publishers/writer friends are not responding to your calls or emails this week, just remember that today marks the start of BookExpo America (BEA). For those of you who don’t know, BEA is the largest annual book trade fair in America. 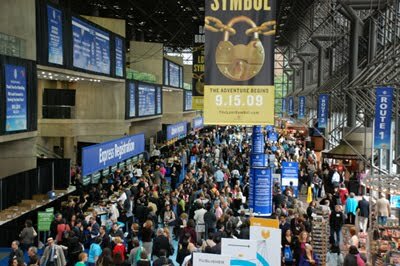 Held in New York this year, the expo sees most major publishers (both from the US and overseas), authors, agents and editors arrive to promote new titles, technologies, digital formats, and along the way, sell some books. So, if you are waiting on a response about your manuscript from someone in the publishing industry, it might be awhile. I would go ahead and put in the second disk of that Ken Burns documentary that’s been holding up your netflix que and get comfortable. And even if you are not attending or involved with BEA yourself, this can be a productive week for you. This would be a great week to put blogging and social media on hold in favor of buckling down and getting some work done on your manuscript. You’re simply not going to find a better block of time to add a quick ten or twenty thousand words to your novel outside of NANoWriMo (National Novel Writing Month) or an extended prison stay. I’ll be keeping up with the expo and will try to post news and updates as they become available. Don’t despair if you didn’t make it to BEA this year, keep working hard on your manuscript and maybe you’ll be there next year signing copies. If you did attend this year or in past years, leave us a note and let us know how it was. PS. I just stumbled on this mention from SF Signal. Make sure to check them out. They’re a really great science fiction site. Pretty cool to be linked in the first week or so of my blog’s existence. Many thanks to them. This entry was posted in Apple coming to BookExpo America, Book conventions, Book Expo America, Conventions, SF Signal. My agent is actually there right now. Oh, how I envy the attendees. So, to keep myself busy, I'm actually doing what you suggested. Adding chapters to my WIP. I thought I was done, but apparently, there are still chapters left to be written. That's great, Kate! I know it would be nice to be there, but I'm sure anything you add to your manuscript this week will be golden. Good luck! And let us know if your agent returns bearing goods news of any sort. New follower here, The Exiles of the New World looks very interesting. I'll definitely have to check it out when it's all done. I also love the cover art!